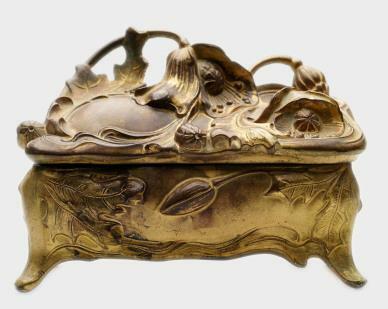 How are rare jewelry boxes classified as rare or unusual? From the time of the ancient Egyptians people have been creating beautiful boxes to keep their custom made jewelry safe. Up until the Industrial Revolution in the early 1800s the boxes were made by hand. Each was as individual as the person it was made for. These are the rarest of all boxes because of the singular nature of each box. The jewelry boxes, while mass produced, are rare due to the wearing down of the materials over time. The hinges broke especially easily, and the finishes wore off. It is rare to find one of these art metal jewelry boxes in good condition. A brief , but informative, overview of these boxes can be found at the ASCAS website. Some of these art metal boxes were made as a match to antique dresser sets. These sets are very rare if found complete. Enamel boxes manufactured by artists like Fabergé or Limoges are an unusual, and often expensive, find. These were imported from France and carefully detailed with beautiful portraits, landscapes and flowers. The bright, enamel colors are often as vivid today as when they were first applied. Other types of rare jewelry boxes are the commemorative designs and motifs that were created for a specific event. The more unusual or historic the event, the more rare the jewelry box. Events like the 1904 World's Fair were often celebrated with the manufacture of a series of products as promotional items. These products often seemed of little value to the owner because of the humble beginnings and often were thrown away or lost in the depths of an attic or basement. Today these commemorative boxes can be worth quite a bit of money to some collectors. Tramp Art was a type of folk art that was very popular in the United States from the late 1800s through World War II. The name Tramp Art came into being in the early 1950s but the items were not made by tramps, necessarily. The creator used found materials, often cigar boxes, to make various items including jewelry boxes. The cigar boxes were takes apart and carved, whittled, notched, layered and glued to make beautiful items. Tramp Art boxes were fragile items, easily shattered by the unwary. Today there are quite a few people who collect this primitive art form. The intricacy and delicacy of the jewelry box will determine the value, however each of these is rare because there is only one like it. Once you have your box display it carefully, away from direct sunlight. Try to keep the room temperature even, and wash your hands before touching the box to make sure that the natural oils in your skin, and dirt, do not adhere to the finish. By taking good care of your rare jewelry box you will have it to pass down for generations.